Bulgaria’s ‘Dagger’ Hristo Stoichkov and ‘The Dutch Wonder’ Johan Cruyff are both legends whose names have reached far beyond the sporting world. They are synonymous with their countries and they also worked together to create the football ‘Dream team’ in the early 1990s, however, their professional relationship was far from dreamy and ended in anger and despair. The Cruyff Turn, a football trick that he perfected, means that Johan will never be forgotten. Football commentators also still use his name every time they see an outstanding goal after the special effort by "Pythagoras in boots" for Barcelona against Atletico Madrid in the 1970s. Stoichkov himself has become so entangled with his country that if you mention Bulgaria to someone who doesn’t even know where it is – the normal reply is “ah...Stoichkov”. He is a self-proclaimed god in boots and took Bulgaria to lofty heights in the 1994 World Cup. 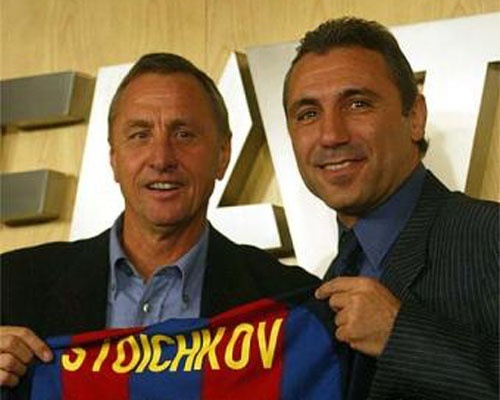 The relationship between the two was bound to be successful right from the moment Cruyff bought Stoichkov into the Barcelona squad from CSKA Sofia in 1990 after himself only being at the helm for 2 years. As part of Cruyff's 'Dream Team', Stoichkov and his Dutch teammate and very close friend Ronald Koeman helped Barcelona to the most successful era of the club, winning the Primera Division four years in a row between 1991 and 1994 and the European Cup after defeating Sampdoria in 1992. In his first season with the club Stoichkov, hot-headed from the very start, was suspended for two months for stomping on a referee's foot, but he still netted 14 league goals and six more in the UEFA Cup Winners' Cup. He went on to score 76 goals in 151 appearances under Cruyff at Barcelona. In 1994 he Stoichkov was named European Footballer of the Year after leading Bulgaria to the 1994 World Cup semifinals. This however was the beginning of the end for the Stoichkov-Cruyff partnership as the 94-95 season bought their arguments out into the public eye like never before. In 1995 it was reported that the pair were no longer on speaking terms and the striker's future at the club was in doubt. "There is no question of me packing my bags now," Stoichkov said, "but whether I will be here next season is another matter." told the UK Independent. The first signs of cracks between the two is when Stoickov told the Bulgarian media, after a game in which Barcelona drew 0-0 with Valencia, that Cruyff was using favoritism in the dressing room. The 28-year-old Stoichkov then launched a famous public attack on his Dutch coach at the presentation of Fifa's world player of the year award to his friend, and former Barcelona team-mate, Romario. "Something has gone wrong between me and the coach," he said. "When we lose I am always the one singled out for blame. When we win, the whole team gets the praise." Stoichkov had arrived late for the award ceremony in Lisbon and blamed Cruyff for delaying his departure by forcing him to join the team for morning training in Barcelona. On his return from Lisbon, Stoichkov initially refused to join the team for the flight to Malaga, where they played a friendly match against the German club Werder Bremen. He relented after talking to his business manager, Joseph Minguella, and joined the rest of the squad. An astonished Cruyff never forgave Stoichkov, telling him to live up to his reputation and responsibilities. After Barcelona lost 5-0 to arch rival Real Madrid Cruyff then singled Stoichkov out for amazingly harsh criticism; "Stoichkov should concentrate on training and playing, and start worrying about praise and awards later. Not the other way round." There was no way back for either of them as training room arguments and the fan’s discontent – mostly targeted at Cruyff as Stoichkov had become a fan’s favorite - led to the Bulgarian leaving for Parma and Cruyff taking a 13-year break from management after having led Barcelona to a record 11 trophies. The sad and bitter end to their journey together was particularly felt by the Barcelona fans who would have to wait a decade before the current dream team of Messi and co. came along. The famous Bulgaria-Dutch relationship will however always be remembered at the Nou Camp and by football fans from around the world for being full of entertainment, glorious goals and heavenly talent that bought Barcelona back to where it belongs – on top of the beautiful game.